Hiya guys! So as you may have noticed I am once again debuting short round nails. I'm not going to lie, it's a complete bummer. Not only because I do really love my normal longer length, but also because the break happened so quickly after my first. But hey not all of us can have long nails all the time, so instead of hiding out while they grow I'm going to keeping doing my thing. It definitely helps having gorgeous polishes to swatch and brighten my day. 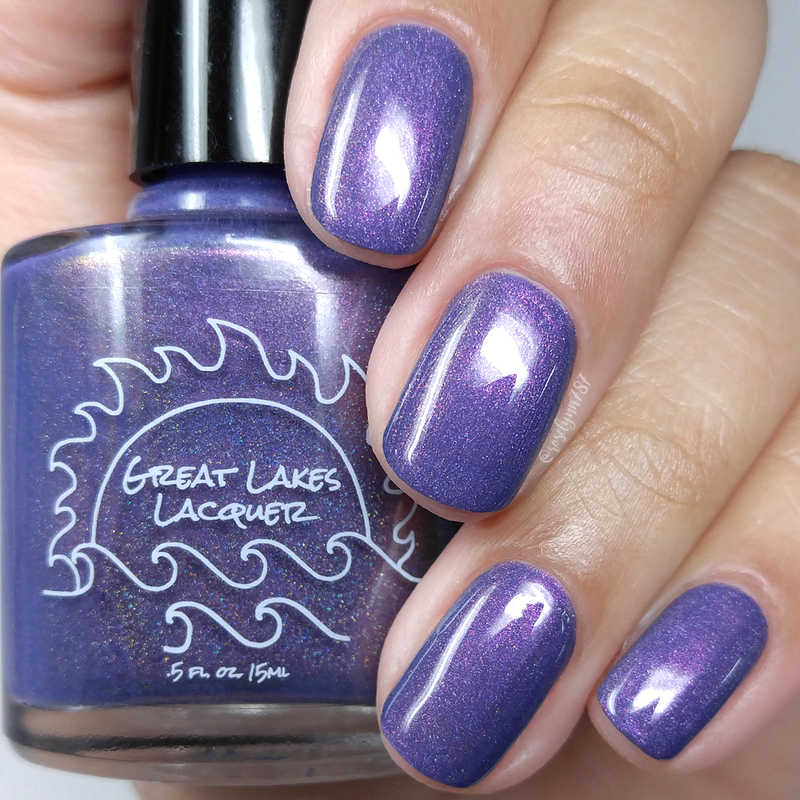 Today I'm sharing swatches for the 2nd Anniversary Duo by Great Lakes Lacquer, along with a one-time patch of a LE shade. While this isn't a new-to-me brand, it's the first time I am sharing Mariah's creations on my blog. Before we get started, a special congratulations to Mariah for a super successful two years in business. Here's to many many more! 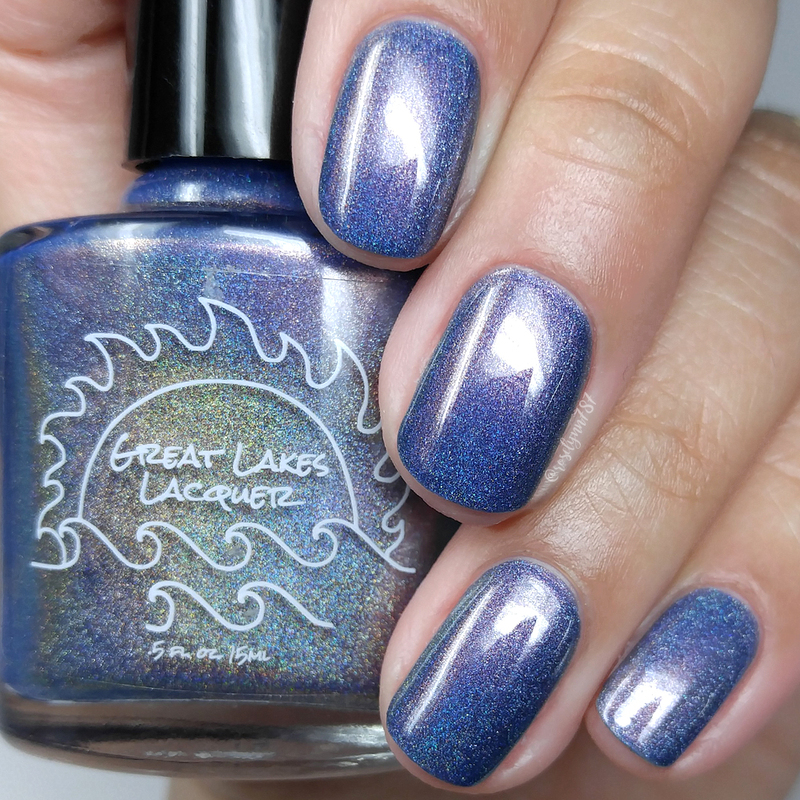 The 2nd Anniversary Duo by Great Lakes Lacquer will be releasing on Wednesday, July 12th at 2PM EST. Each full-size 15mL shade will retail for $12. These are limited edition and will only be available until August 2nd at 2PM EST. The one LE shade, Running Like a River, will be one-pour and not be restocked. Running Like a River can be described as a deep, dark blurple linear holographic with red/gold/bronze/green multichrome pigment running throughout. As I mentioned, this shade will be a small batch and will be not be made again. 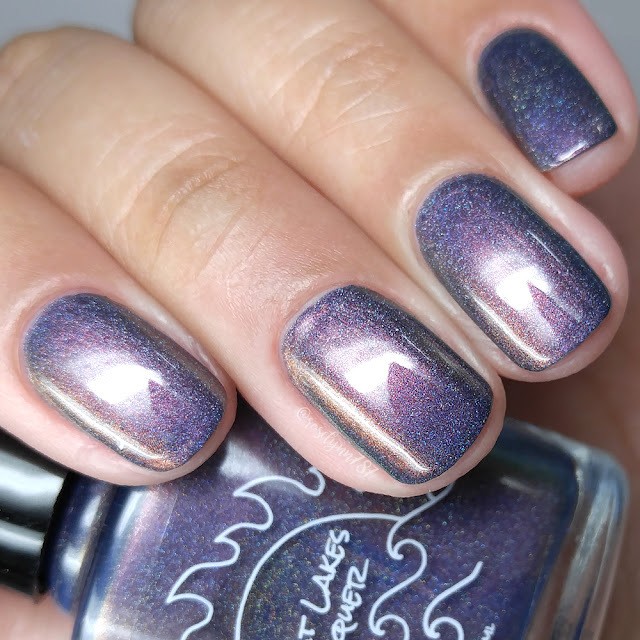 The formula has a great opacity, not too sheer and builds-up smoothly. The consistency leans a bit on the thin side, but it's manageable and not runny. Minimal brush strokes in the finish blend out perfectly. Shown in two coats and sealed with a glossy topcoat. Now it's time to take a look at the anniversary duo! 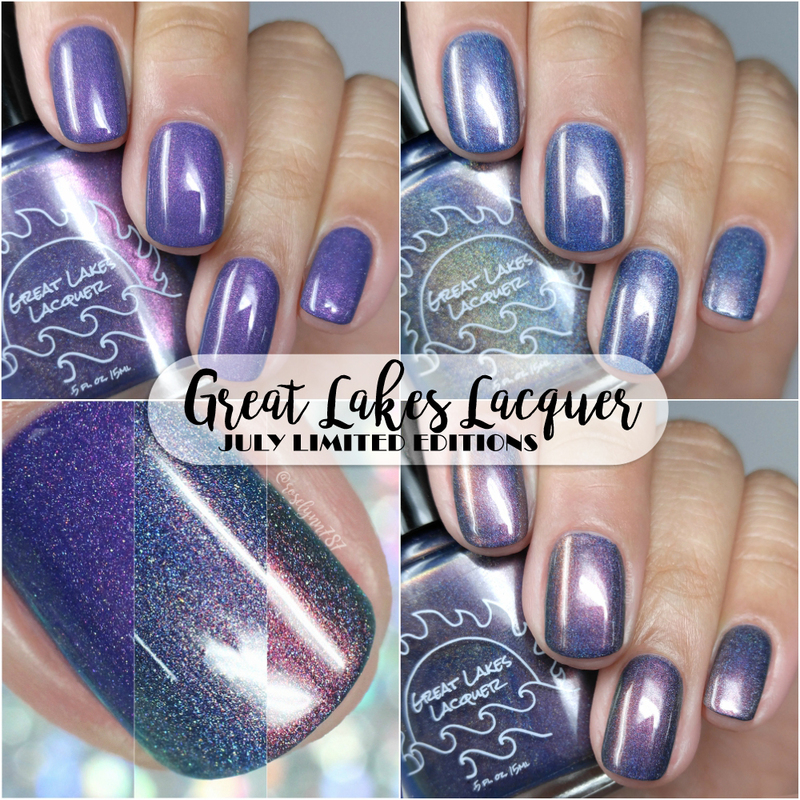 2 Year Love can be described as medium creamy violet linear holographic with multichrome pigment shifting from fuchsia to gold and green. The formula has a very opaque application, almost enough to be an easy one coater. Barely needed the additional coat, moreso for sparkle than coverage. I did find the consistency to be a bit on the thick side, but it's manageable. I experienced no staining on removal to either my cuticles or nail bed. Shown in two coats and sealed with a glossy topcoat. Fluidly Flowing can be described as a deep blue linear holographic scorched with multichrome pigment shifting from red to bronze to orange to gold and maybe a bit of green. The formula has a sheer application, but builds-up really well for full coverage. Consistency wise it tends to lean thin, but not so much that it affects layering. I cannot get over how smooth it feels as it glides onto the nail, very impressive. I'd also like to note I didn't experience any staining on removal (also an important factor for any blue shade). Shown in two coats and sealed with a glossy topcoat. Overall all three of these shades are absolutely stunning in every regard. Really I feel like my photos don't do any justice to how beautiful these are in person. 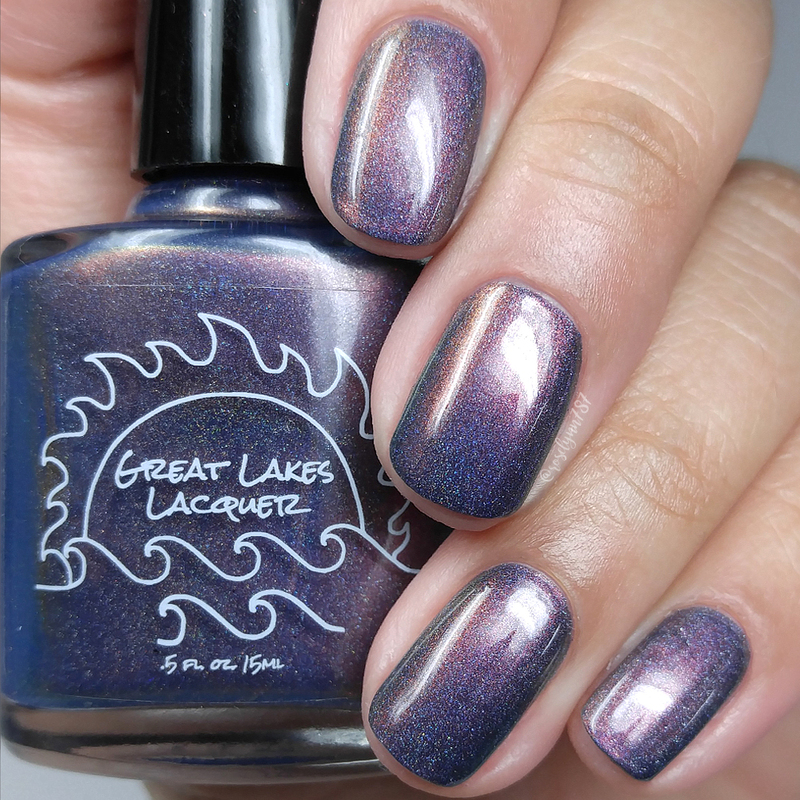 To recap, the 2nd Anniversary Duo by Great Lakes Lacquer will be releasing on Wednesday, July 12th at 2PM EST. Each full-size 15mL shade will retail for $12. These are limited edition and will only be available until August 2nd at 2PM EST. The one LE shade, Running Like a River, will be one-pour and not be restocked.